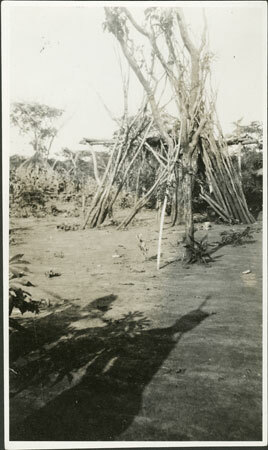 A tuka or spirit shrine in the centre of a homestead, with shadows of Zande people cast from behind the camera. Such shrines are sites for medicines or ngua that are invoked to ensure ancestral (spirit) favour for the inhabitants of the homestead. This shrine has a number of short sticks bound to it, probably used for consulting the dakpa or termite oracle. A stick stuck in the ground nearby has begun to sprout. Notes on card mount m/s pencil - "SS overall esp. LHS & RCS? +fading 8.89"
Morton, Chris. "Zande spirit-shrine in homestead" Southern Sudan Project (in development). 03 Jan. 2006. Pitt Rivers Museum. <http://southernsudan.prm.ox.ac.uk/details/1998.341.739.2/>.